The body of Lloyd C. Dillon, who was killed in action August 1, 1943, in North Africa, has been returned to the States for reburial. Funeral services will be held Friday afternoon at 4:30 at Fair's Leaksville-Spray Funeral Home. Military honors will be presented at the graveside by the local V.F.W. The local National Guard unit will serve as pallbearers. Pvt. 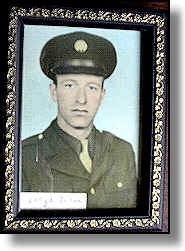 Dillon was born March 15, 1917 and reared near Woolwine, Va. 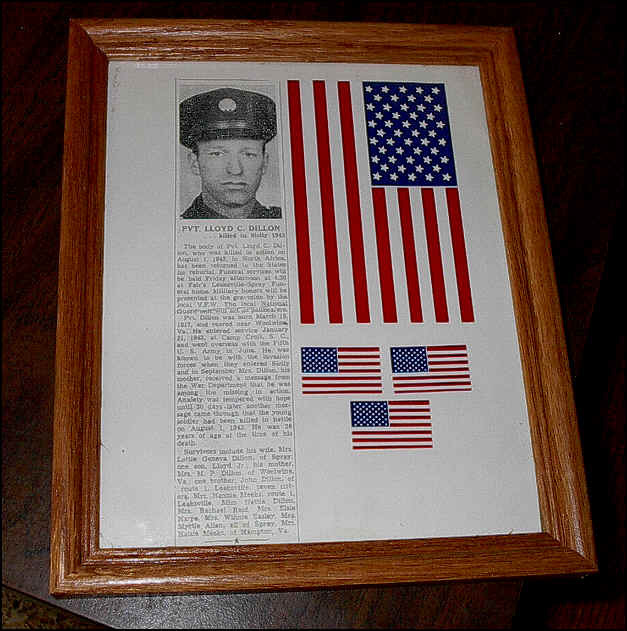 He entered service January 21, 1943 at Camp Croft S. C. and went overseas with the Fifth U. S. Army in June. He was known to be with the invasion forces when they entered Sicily and in September Mrs. Dillon, his mother received a message from the U. S. War Department that he was among the missing in action. Anxiety was tempered with hope until 30 days later another message came through that the young soldier had been killed in battle on August 1, 1943. He was 26 years of age at the time of his death. Survivors include his wife Mrs. Lottie Geneva Dillon of Spray; one son Lloyd, Jr.; his mother Mrs. M. P. Dillon of Woolwine, Va.; one brother, John Dillon of Route 1, Leaksville; seven sisters, Mrs. Nannie Meeks, Route 1, Leaksville; Miss Nettie Dillon, Mrs. Rachel Reid, Mrs. Elsie Harp, Mrs. Winnie Easley, Mrs. Myrtle Allen, all of Spray; Mrs. Halsie Meeks of Hampton Virginia.